In the end, Luis Enrique’s men dominated the game, as was expected, however their chance creation and finishing and disappointing while Malaga showed the defensive organisation that earned them a clean sheet versus Unai Emery’s potent Sevillla side last weekend. Barcelona played with great width from the outset and played via the flanks in the first half. 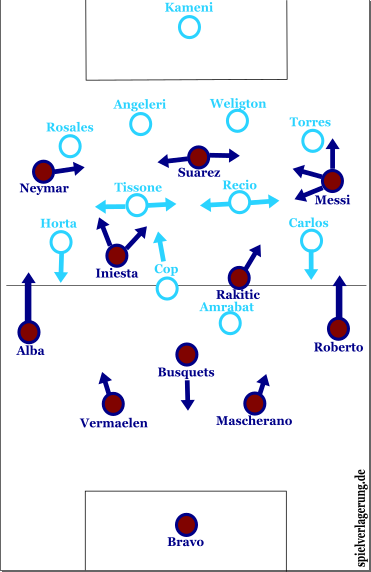 They looked to utilise the combinations of Neymar and Alba on the left and Messi and Roberto on the right. The aim was to use these combinations to pull out the Malaga full-back on that particular side and then penetrate the halfspace. An image of Barcelona’s positioning in Malaga’s half is shown below. Barcelona’s width. La Salida Lavolpiana with Busquets. Malaga’s 4-4-2 defensive shape. One of the things Luis Enrique will be most encouraged about from his side’s opening two fixtures is the combination of Sergi Roberto and Lionel Messi on the right hand side. Roberto played the whole match very high up the field and linked up with Messi well, both with passing and in creating space with him with movement. Below is an example of this. The ball is switched to Messi who is hugging the right touchline. Roberto makes a run inside. Roberto occupies Torres, leaving Carlos isolated 1v1 with Messi. Messi beats Carlos cutting inside. Roberto screens Torres and Messi has time to pick out a pass for Neymar who gets a shot on target. Roberto underlaps, isolating Carlos 1v1 with Messi. Roberto screens Torres and Messi cuts inside and has the time and space to pass to Neymar. Roberto, reminiscent of Alves, would overlap Messi, giving the fullback the option to either go with him, and leave space for Messi to cut inside, or stay with Messi and give Roberto space to receive a pass from Messi and cross. Malaga controlled central areas very well (more on this later) and Barca were forced to find spaces on the flanks. Below, is an example of them switching play to an overloaded right flank, with Vermaelen very high up. Very good one on one defending in wide areas meant that these attempts were fruitless. Barca wide left overload. Barca were forced to switch play from side to side to find an opening in Malaga’s defence. Barcelona central orientation in the second half. This caused Barca to be a lot more offensively productive in the second half, having 14 shots compared to only 8 in the first half. The full-backs provided width while Neymar played mostly in the right halfspace and Messi was in the middle. If you have possibly the best player of all time in your side, you want him to be in the most dangerous areas and this is why Messi is much more effective when playing in central areas. This shape as we can see above also means Barca were a lot more effective at counter-pressing. They limited Malaga’s attacks much better in the second half after the Albicelestes had a few threatening counter attacks in the first half. They played more like Guardiola’s Barca, using quick passing combinations and overload of central areas to penetrate Malaga rather than using width. They were a lot more exciting playing this way however, ironically, their only goal of the game came from a cross from a wide left position which was poorly cleared and fell for Vermaelen to finish. Malaga played with a medium block 4-4-2 in the defensive phase which was fairly horizontally compact and aimed at controlling central areas. They were spatially orientated as a unit however used situational man-orientation, often when Suarez tried to drop to receive the ball, or when Messi drifted inside. Having two forwards next to each other, rather than dropping into a 4-4-1-1 or a 4-5-1 when defending deep in their own half as many teams do when coming to the Camp Nou, meant that Barca struggled to switch the ball via the midfielders and had to go all the way back to Busquets on the halfway line to switch the play. Playing with two forwards also meant that Busquets spent most of the match in a back three to overload this, enabling Barca to switch play. More on this later. Malaga switched to a back five at around the hour mark (or at least situationally when they were defending deep) and they played in a deeper block which was a sign of them looking to hold out at 0-0. This 5-4-1 is shown below. Malaga lack pace in their defence and therefore would be vulnerable both on the counter attack, and also when they left space behind them in their medium block. Barca kept Messi, Neymar and Suarez high up the pitch and ahead of the ball at almost all times when Malaga were attacking. This obviously meant that Barcelona would be very dangerous on the counter attack. However, Barcelona rarely got a chance to counter-attack as Malaga counter-pressed very well to prevent Barca counter attacking. Malaga performed a half-ball/half-man orientated counterpress as shown below. One of the things sets Busquets apart from most pivotes in world football is his ability to play low, vertical, disguised passes that penetrate through the opposition’s pressing lines centrally. I felt that during the match against Malaga, he was too reliant on standing on the centre spot between Barca’s centre-backs so he could switch play. This was maybe due to the fact that Malaga played in a vertically compact 4-4-2 so Busuqets’ presence would be needed in deeper areas to allow for a 3v2 against Malaga’s forwards, meaning that Malaga could not press the ball. Anyway, I feel his creative presence was missed high up the field, especially now that Rakitic has replaced Xavi in the starting XI over the last year or so. It is clear that when Busquets plays well, Barca play well. Below are his ‘forward pass’ maps from the match Vs. Malaga, when Barca were average at best, and from last season’s Champions League Semi-Final first leg when Barcelona beat Bayern 3-0. 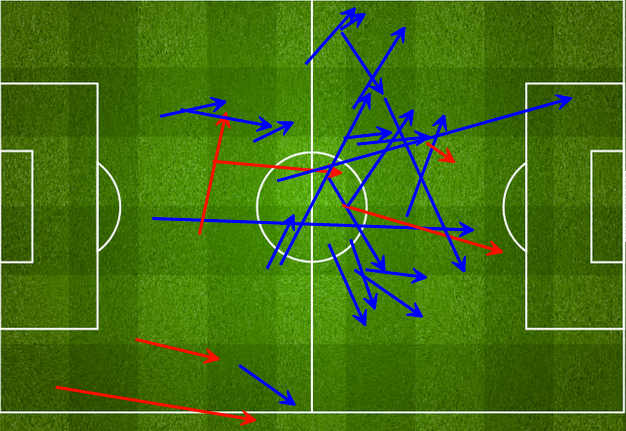 Notice the verticality in his passing in that match, vs. the deeper switching of play role he had against Malaga. “A failed vertical pass is better than a completed sideways one” Busi’s passmap vs Bayern. His passes are more vertical and are from positions higher up the field. Busquets’ forward passes vs Malaga. Barcelona have managed to get six points from the opening two fixtures but it is the goals scored column of the league table that will concern Enrique the most. A combination of lack of quality chance creation and lazy finishing are the reasons that Barcelona had to rely on a 73rd minute goal from Thomas Vermaelen of all people to win the match. Malaga will be pretty happy that they managed to hold Barca for so long and were by no means anti-football for the whole ninety minutes. On the same night Rafa ‘defensive’ Benitez’s Real side won 5-0, showing that the Primera Division title isn’t as much as of a foregone conclusion as some thought. However, Barcelona did dominate the game and did have thirteen shots on target. I’m sure the Blaugrana will be back to goalscoring form after the international break. Like the site and the analyses, I have a question though. What software do you use to make the drawings? Thanks very much. We use Inkscape for the diagrams. Hier would you have played against Malagas two strikers? Agree that Busquets creativity and ability to counterpress was missing in higher areas, but a line of 3 with the goalkeeper in the middle is to risky that high of the pitch. One could see the back three with Busquets from the very beginning, so it probably was an order from Enrique. What I really missed where Mascherano of Vermaelen stepping up to midfield. When Messi and Neymar than positioned themselves in the half-spaces, ist could create a lot of danger. I think Messi is generally a lot more useful the more centrally he is deployed. Personally, when playing in a 4-3-3 against a four-man defence, I like to see teams using both fullbacks in the flanks, wingers in the halfspaces (or vice versa) and a forward in the centre as it creates a 5v4 overload on the back line.